The most actual platform for new contacts of artists, art galleries and art collectors. There you´ll find more recent works, which are still available. Born in north-west Germany, he is now living and working in his private retreat in southern Portugal. His inimitable style of fantastic realism is shown in his fantasy architecture which offers a glimpse into the ruins of a fallen civilisation with minute attention to detail. 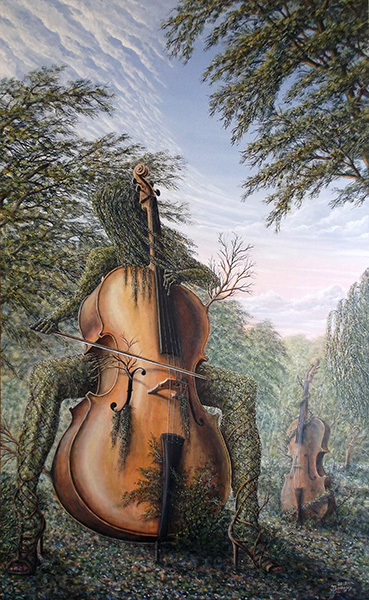 Other more fairytale scenarios are found in "music-" or "chess landscapes". In the last 45 years Bruenjes created more than 500 paintings, hanging in private or public collections and museums mostly in Europe, but also all over the globe. Das Forum für Künstler, Galleristen und alle Kunstliebhaber. Der am Rande des Teufelsmoores geborene, international bekannte Maler Bruenjes lebt und arbeitet heute auf seinem Landsitz im Süden Portugals. Seine sehr spezifische Art des phantastischen Realismus zeigt eine Phantasiearchitektur, die uns erlaubt in die Ruinen einer vergangenen Zivilisation einzutauchen, mit minutiöser Aufmerksamkeit zum Detail.